Restraining orders are taken very seriously in Massachusetts. Having to file one or having one filed against you directly impacts a family and can be emotionally traumatic for all parties involved. Anyone who has filed for a restraining order or has had one filed against them should have legal representation they can trust and count on to protect their rights. Stephen M. Forlizzi is a criminal lawyer in Massachusetts and has many years of experience helping people deal with the complications and emotions that come along with restraining order cases. 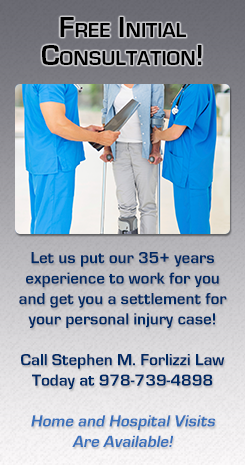 Our firm can handle your case with the sensitivity and dignity needed. A restraining order can be issued against someone as a means of protection from physical abuse or the threat of physical abuse. If someone is in fear of imminent physical harm or has been physically forced into sexual relations or threatened into having sexual relations, a restraining order can be sought. Who Can I File a Restraining Order Against? In Massachusetts, a restraining order, also known as a 209A protection order, can be filed against a spouse or a former spouse. A restraining order can also be filed against a blood relative or relative by marriage. Also, a restraining order can be filed against a member of a household or someone you may have or had a significant relationship with. A restraining order will immediately halt the abuse or threats of abuse. When an order is issued, the alleged abuser must leave the home and have no further contact with the person seeking protection. This includes indirect contact also. The person served with the order can’t go to that persons work and can’t contact any children involved. They will also have to give up any firearms they own. The person who was served with the order also has to continue to pay utilities or rent on the house they were forced to leave. The person who serves a restraining order may be scared, confused, and unsure of their future. When someone is served with a restraining order, that order may compromise their work, reputation, and any custody or divorce proceeding they may be involved in. The consequences, both immediate and long term, can affect both parties greatly and permanently alter a family dynamic. Having compassionate and dedicated legal representation on your side can help ensure the best possible outcome. The Law Office of Stephen M. Forlizzi will explain the laws, explain your rights, and prepare you for what may happen, both short term and long term. Our firm will guide you through any restraining order situation and help reach a resolution for your case. Contact defense Attorney Forlizzi at 978-739-4898 for a Free Consultation on your restraining order.